Shanti Thakur’s body of work is informed by growing up with immigrant parents, from India and Denmark, in francophone Montreal. Our connections and disconnections to each other drive her stories. With both precise and lyrical vision, Shanti looks at this blurry divide through the lens of history, memory and identity. Shanti writes, directs, produces and edits her work, pushing the boundaries of fiction and documentary modes. Her films have screened in 200+ international film festivals and museums, and have broadcast internationally. Screenings include Cannes Film Festival, Hamptons International Film Festival, Montreal World Film Festival, Margaret Mead Film Festival, Robert Flaherty Film Seminars and the Museum of Modern Art in New York. Her body of work has on 26 awards. 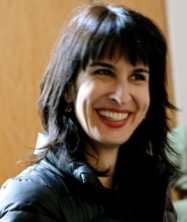 Her documentary work, produced and distributed by the National Film Board of Canada, ranges from aboriginal justice in the Yukon (Circles: It’s About Justice, It’s About Healing), to interracial families through the children’s eyes (Domino), to community video to counter mainstream media’s racialized narrative about a white woman murdered in a mixed Montreal neighborhood (Crossing Borders). Ranging from no budget to six figure budgets, these films broadcast in 22 countries and garnered top documentary awards. Her documentaries were made in collaboration with the communities involved, creating a level of trust and intimate point of view rarely seen. Circles was presented in South Africa during the reconciliation trials by the members in the film. It is also used as a tool to train RCMP cultural sensitivity with aboriginal communities. Circles is taught in numerous law programs around the world to study restorative justice. Shanti’s work developed into hybrid forms – where hard-edged facts meld with lyrical point of views. Seven Hours to Burn, an experimental-documentary, explores her parents’ childhood in two parallel wars, Partition-torn India and Nazi-occupied Denmark. Ghostly archival footage is interwoven with impressionistic imagery. Winning ten top awards, invited to 50+ international film festivals, Seven Hours broadcast on the Sundance Channel and is distributed by Women Make Movies. Seven Hours is in the Gene Siskel Film Center’s permanent collection and was a New York Times Critic’s Pick. Shanti’s fiction gravitates towards the imaginary world of speculative fiction, where she explores the boundaries of human nature as societal norms are pushed to extremes. Red Tulips, A Story About Forgetting is about a magical world where memory lasts only a few hours. Red Tulips won Best Narrative Film at the Columbus International Film Festival, the Grand Remi Award (Best of the Fest, Experimental Film) at the Worldfest-Houston International Film Festival and the Golden Cine Eagle Award. Screenings include Los Angeles International Short Film Festival, Mill Valley Film Festival, St. Louis International Film Festival and Athens International Film Festival. Sky People, her lyrical satire on class in New York City, follows the race of 21 different characters to be a “sky-person” – the elite one percent who live above the 13th floor. Awards include: Best Experimental Film – Los Angeles International Short Film Festival, Best Narrative Film – Columbus International Film Festival, Platinum Remi Award for Experimental Film – Worldfest Houston, Best Narrative Faculty Film –University Film and Video Association, Best of the Fest – Chicago International REEL Shorts Film Festival. Sky People qualified for consideration for an Academy Award for Live Action Short. Her first fiction piece Kairos was made possible by the Pew Fellowship of the Arts, winning the Best Audience Award: Dramatic Short – New Haven Film Festival and Best Editing Award – Rhode Island International Film Festival. All of her fiction films are distributed on VOD through Indieflix. Shanti has been a judge for the iEmmy Awards, NYFA, Multiculturalism Canada and Scholastic. She has given artist presentations at numerous colleges and universities, including Bryn Mawr, Bennington, Barnard, MIT and Harvard University. Shanti is currently Acting Chair and Associate Professor of the Film and Media Studies Department at Hunter College, City University of New York. She teaches undergraduates and graduate students in the MFA program of Integrated Media Arts. She holds an MFA in Film and Media from Temple University, a BA in Communications from Concordia University in Montreal, and a BA in Psychology from Ottawa University.